Chase’s Sapphire Preferred is arguably the most blogged about credit card out there. Why is that, you ask? It can’t be because of the rewards categories – they’re pretty lackluster. Is it the sign-up bonus? Meh, it’s no Ink Plus…. so, what is it? The commission check, I’d assume. Now, I have nothing against credit card marketing. Heck, I even market credit cards (see the sidebar), but I don’t shove them down your throat and I only suggest them for specific needs. For example, if you were planning a trip from Boston to Dublin in business class, I wouldn’t suggest the Sapphire Preferred – at least not right now. It only offers a 40,000 point sign-up bonus, which converts to 40,000 Avios, leaving you 10k shy of your goal. Note: After hitting the minimum spending requirement and adding an authorized user to your account, you’d only be 1k shy. Instead, I would suggest the British Airways Visa which offers a 50,000 Avios sign-up bonus (53,000 after hitting the minimum spending requirement). That’s only 4,000 Avios different, but 4,000 Avios is almost enough for a one way flight under 650 miles! As I mentioned above, the sign-up bonus for Chase’s Sapphire Preferred is 40,000 points after $4,000 in spend during the first three months of card ownership. They also offer an additional 5,000 points after you add an authorized user to your account, which works out to 49,000 points after the spending and adding is all said and done. 49,000 points is a good sign-up bonus, but it’s not great. Many airline credit cards (e.g. United, American Airlines, Delta, British Airways, ect.) offer at least 50,000 mile sign-up bonuses regularly after only $2,000-$3,000 worth of spend. Assuming the latter, that’s a $1,000 less of manufactured spending and 4,000 more miles. I know what you’re thinking, those airlines don’t offer flexible points like Chase does. That’s true, but you know who does? Chase! I’m talking about the Ink Plus, of course. You know, one of the other Ultimate Rewards earning cards from Chase. The Ink Plus comes standard with a 50,000 UR point sign-up bonus and it normally goes up to 60,000 and even 70,000 points occasionally. That’s a lot of extra points for the same point system! The Sapphire Preferred offers such boring reward categories. You earn 2X on dining and travel and 1X on everything else. Just writing that makes me sleepy. You know what cards offer better rewards categories? *Almost all of them! The Ink Plus earns 5X on office supply store purchases, cable, internet, and phone. It also earns 2X on hotels and gas stations and 1X on everything else. That sounds like a lot more earning possibilities to me! Oh! I forgot the most important reward category for the Sapphire Preferred: First Fridays!!!!!!!!!!!!!!!!!!!!!!!!!!!!!!!!!!!!!!!!!!!!!!!!!!!!!!!!!!!!!!!!!!!!!!!!!!!!!!!!!!!!!!!!!!!!!!!!!!!!!!!!!!!!!!!!!!!!!!!!!!!!!!!!!!!!!!!!!! With First Fridays, you get 3X points on all dining purchases during the whole first Friday of every month!!!!!!!!!!!!!!!!!!!!!!! WHAT!?!?!?!?!?!?!?!? HOW COOL RIGHT!? YA!!!!!!!!!!!!!!!!!!!!!!!!!!!!!!!!!!! Sorry, I got carried away with my sarcastic exclamation marks. If the First Fridays got you all excited about the card, I’m sorry to burst your bubble, but Citi’s ThankYou Premier earns 3X points on ALL dining purchases (until 4/18/15). In addition to that, the other Ultimate Reward card, the Chase Freedom, earns 5X points on all dining purchases in April, May, and June (up to $1,500 in purchases). *crickets* *crickets* Yeah, there isn’t a retention offer. Ever. If you want to keep this card after the one year mark, you’re going to be paying the $95 annual fee. Everyone has an everyday card for when they’re not trying to hit a minimum spending requirement, an annual bonus, or reward category, but the Preferred shouldn’t be it. There are quite a few better cards out there. For example, the Amex SPG is a great everyday card. It only earns 1X points on every purchase, but SPG points are very valuable since you get an additional 5,000 points for every 20,000 that you transfer to travel partners. If you are determined to earn Ultimate Rewards with your everyday card, you could always use an Ink Plus or a Freedom. The former has an annual fee with a lot of high earning reward categories, that can usually be waived. The latter doesn’t have an annual fee and earns 5X points on rotating categories. Those cards offer a lot more point earning opportunities. After all you’ve read, it may sound like I hate the Sapphire Preferred, but I promise you I don’t. In fact, there are certain scenarios where I would actually suggest getting the card. I just hate the ridiculous amount of publicity it receives when in reality it’s not THAT great of a card. You want to churn the card for the sign-up bonus. You have a specific need for 49,000+ points transferred to a travel partner that you cannot get with a different card. For example, if you need around 49,000 United miles, but the United credit card is only offering 30,000 miles, then the Preferred would be the way to go. You don’t have a business of any kind. In other words, you can’t get an Ink Plus. You need Hyatt points and you already have an Ink Plus/Freedom. 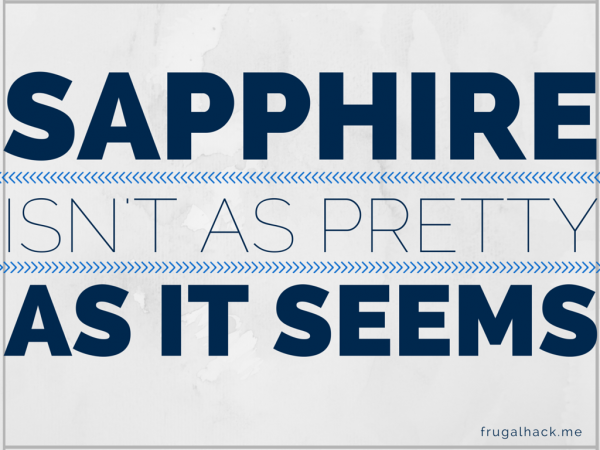 The Sapphire Preferred is a good card worth having, but not keeping. That being said, you should only get it if you need it and I wouldn’t suggest starting your churning journey with this card. There are just too many better options out there. So, what do you think? Am I being too harsh on the card?